First century tillers used oxen to help them plow the land, and when the animal slowed or refused their commands, the tiller would use a prick to jab the animal and regain control. Sometimes the oxen would rebel and kick against the prick, and as a result, get stabbed even harder. It was a lesson of cause and consequence, of insurgence, of anarchy, both against their owners, and against God. Wilson takes this concept of rebellion and weaves it throughout his writing in such a way that his characters know how it feels to be both the tiller and the ox. His verse is sharp like a pointed spike, and his style awakens reader to the gray area in the black and white world of right and wrong, good and bad. Wilson writes without fear and doesn’t shirk from the emotions that surface when he digs deeper, doesn’t hide from the shadows that creep in when he tills harder. The pieces in Kicking Against the Pricks bring an understanding to pain, suffering, and what it means to be conflicted. Wilson brilliantly shines the light on the darkness that hides within us all and envelopes his readers in a raw, emotional, and beautiful journey as noted in Stoker Award winner Linda D. Addison’s insightful introduction. 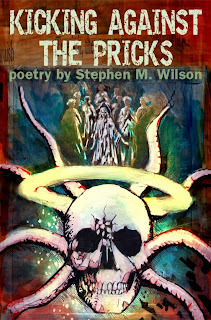 Stephen M. Wilson was Poetry Editor for Abyss & Apex Magazine of Speculative Fiction and also edited the spec poetry Twitterzine microcosms (@microcosms) and San Joaquin Delta College’s literary magazine Artifact. Wilson spent 3+ years as Poetry Editor for Doorways Magazine and co editor of the Science Fiction Poetry Association’s annual Dwarf Stars Award anthology. He’s had several poems nominated for the Rhysling Award and a handful for the Dwarf Stars Award (including a win in 2011). His first book Dark Duet, a collaboration with multi-Bram Stoker Award winner Linda D. Addison, is available from Necon E-Books. Wilson lived in Stockton, CA with his partner and two dogs. More at: http://speceditor666.livejournal.com.